Home News Gary Orr Waits 18-Years For Back-To-Back Victory Buses. Gary Orr Waits 18-Years For Back-To-Back Victory Buses. 6 months ago by Bernie McGuire Comments Off on Gary Orr Waits 18-Years For Back-To-Back Victory Buses. 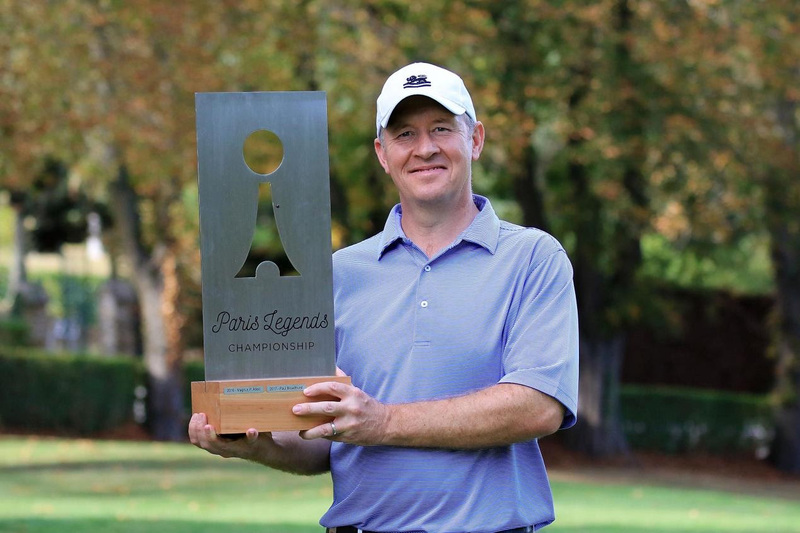 That is what has happened to Scotland’s Gary Orr who clinched the Paris Legends Championship to record back-to-back victories on the Staysure Tour after carding a final round of 68, four under par. Orr ended an 18 years victory drought capturing the recent Scottish Senior Open before claiming a second win at Racing Club de France La Boulie 26 days later to add to his 2000 British Masters and 2000 Portuguese Open wins on the European Tour. The Scot followed up his opening rounds of 71-65 with another sub-70 round, including a birdie-birdie finish to win the title by one shot ahead of Austrian Markus Brier and former back-to-back French Open winner and home favourite Jean-François Remesy. Overnight leader Mark Mouland fell away at the start of the day as a chasing pack of Brier, Paul Eales, Orr and Remesy battled it out over the Golf de La Boulie course. Orr birdied the fifth to move to nine under par, alongside the leading pack, but dropped back as he bogeyed the following hole. However, he remained patient and began his charged on the back nine with a gain at the 11th hole. In the groups ahead of the Scot, Eales surged ahead but found the out-of-bounds on the last, signing for a double-bogey seven to drop back. While home favourite Remesy finished with back-to-back birdies to set the clubhouse target at 11 under par. With Brier joining Remesy in the clubhouse on 11 under par following successive eagles on 17 and 18, Orr called upon his winning mentality to finish birdie-birdie and lift his second title on the over-50’s circuit in less than three weeks. “It’s been a dream run since Willow,” he said. “I started to play well at Willow and I’ve carried that on with two wins in my last two tournaments, so I’m delighted. “I tweaked my back at home in the week after the Scottish Senior Open, so I haven’t done an awful lot of practice. I didn’t play at Forest of Arden last week because it was still a bit sore, so I came here to see how it would hold up and it has worked out way beyond my expectations. Brier and Remesy shared the runner-up spot, while James Kingston signed for a round of 69, three under par, to claim third with Eales and Paul Streeter sharing fifth. 235 N Job (Eng) 80 84 71.